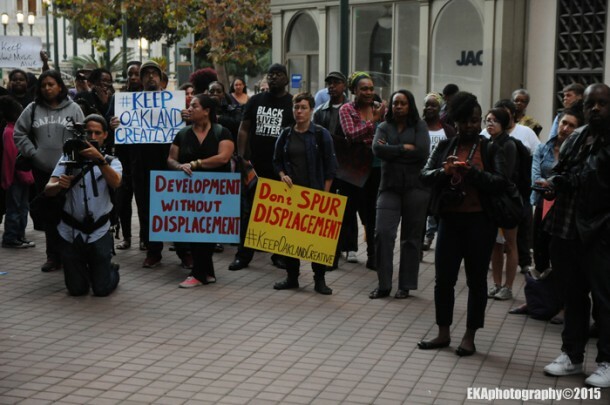 As CRP previously reported, the September 3 kick-off of the public engagement phase of the Downtown Oakland Specific Plan (DOSP), followed the same week by a SPUR report outlining “big ideas,” raised community concerns about displacement and exclusion. 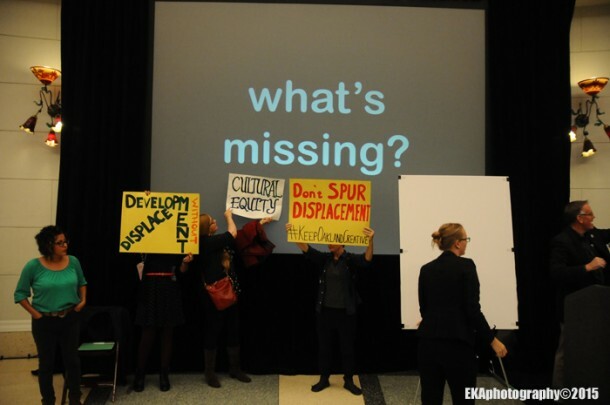 None of those ideas, it seemed, addressed displacement, affordability, or maintaining diversity, and arts and culture seemed an afterthought at best. A second meeting, held October 19, did little to dispel those concerns. 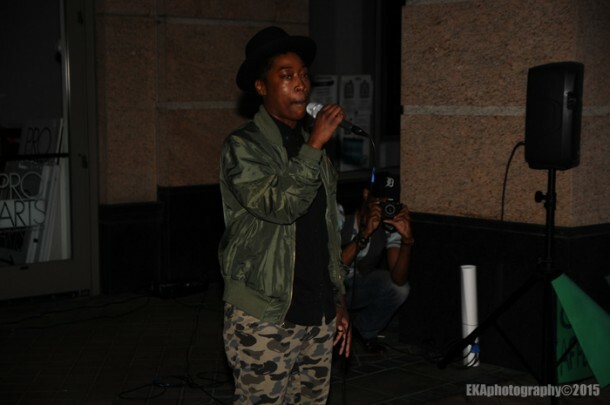 The evening began with a speak-out to defend Oakland’s arts and culture organized by the Oakland Creative Neighborhoods Coalition, which brought together affordable housing activists, #Black Lives Matter representatives, members of black church groups, artists, justice advocates, and musicians. 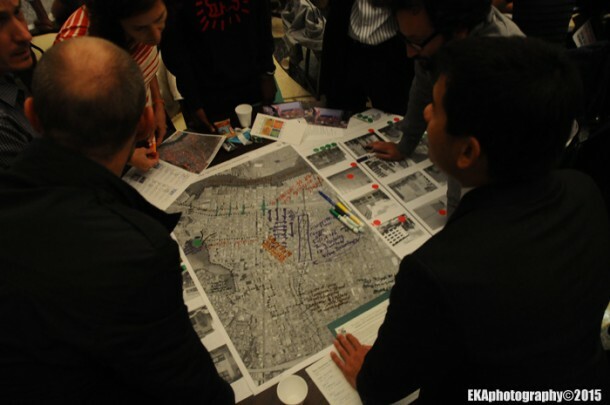 “There were around 20 tables with people sitting around them and the developers were giving their presentation about statistics around downtown. It was extremely quiet, compared to the passion of the community outside. I grabbed a #KeepOaklandCreative sign and stood at the top of the stairs. People were occasionally glancing back, especially when the door opened, and I could tell that they were nervous about the protesters coming in. Finally the speeches ended and the participants were asked to discuss maps and photos on the table to talk about what needed to be added and removed, and what aesthetics they liked or disliked. 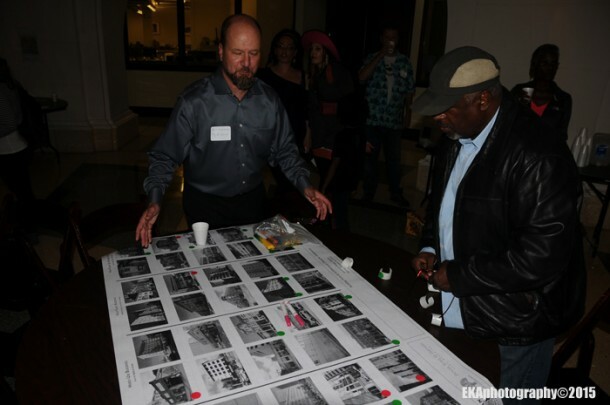 “I joined a table with developers and the temporary director of the public art program. I started writing messages around cultural equity in the process, protections for existing residents and cultural institutions and the need for more public art. The developers had a facilitator at the table and I began discussing the process with them. I brought up the exclusion of the artists from the invitations, the need to reach out to the community rather than expect us to come to them, and the need to engage established arts leaders and culture keepers. These statements were reflected in what I had written down. While the facilitator feigned interest, none of my points made it into the recommendations when he presented back to the larger group. This action was necessary, Mundo says, because “The (DOSP) community engagement process has been flawed from the beginning. Artists have been left out of the conversation and silenced when they attempt to engage the process.” This is troublesome, he adds, because any significant development downtown could have a vast impact on public art and the ability of artists to create a sustainable future. Artists are already being displaced from art spaces due to rising rents, and new murals could be all but eliminated by ground-level parking garages proposed for high-rise development projects. Meanwhile, Oakland’s percent for art ordinance remains in legal limbo due to a lawsuit filed on behalf of developers, and the City Council has still not spent the bulk of the $400,000 it approved in 2013 for abatement murals. 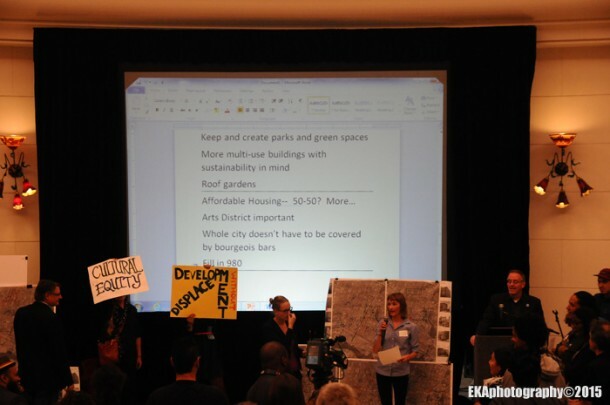 Specifically, OAM noted, the 25th St. strip of galleries are in danger of losing their leases to a developer who plans to build market-rate housing which “will lead to an increase in rents and more galleries forced to move to an unknown destination.” If the Art Murmur galleries—as symbolic a representation of Oakland’s rebranding as there is—are forced to vacate Uptown, the neighborhood they made internationally-known, what does that say about Oakland’s commitment to culture, and the future of arts downtown? Gibson-McElhaney’s statement shows that perhaps there is some political will at City Hall to resist the onslaught of the gentrification nation of developers, techies, and hipsters. It certainly reflects a response to a rising tide of community sentiment which has started to take the form of direct action, and seen a uniting of like-minded organizations and individuals into an ad hoc coalition. Yet it remains to be seen whether Gibson-McElhaney’s cultural protection initiative will win support from the full Council, and whether the Council can work with the Planning Commission to create affordable artist housing and preserve artist spaces which currently exist in downtown. It also remains to be seen what an Arts & Culture Commission would look like – whether it will take an active role in arts advocacy, promoting a cultural equity framework, and leveraging cultural capital with regards to economic development, or whether it will ultimately amount to little more than lip service and business as usual, as was the case with the previous commission. In and of itself, an Arts & Culture Commission will not slow gentrification, and with displacement already taking place, may end up benefitting the “New Oakland” unless additional steps are taken, including a comprehensive Arts Master Plan, a fully-staffed Cultural Arts Department, and a revising of the public art ordinance to be more community-friendly. 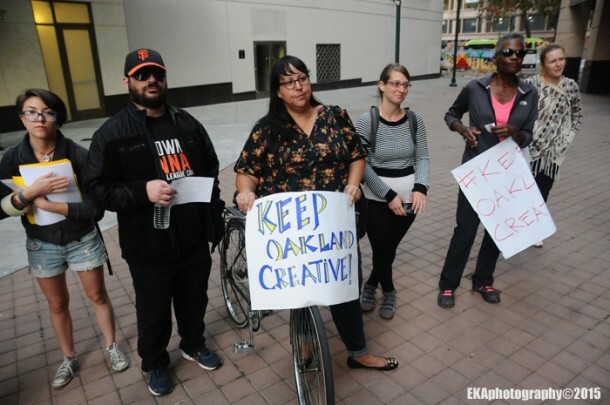 Community pressure appears to be working, however, and the establishment of cultural arts advocacy groups like #SoulofOakland and the OCNC represent hopeful signs that Oakland is not going down without a fight. More members of the creative arts community need to get involved, and add their voices to those which have already been raised. 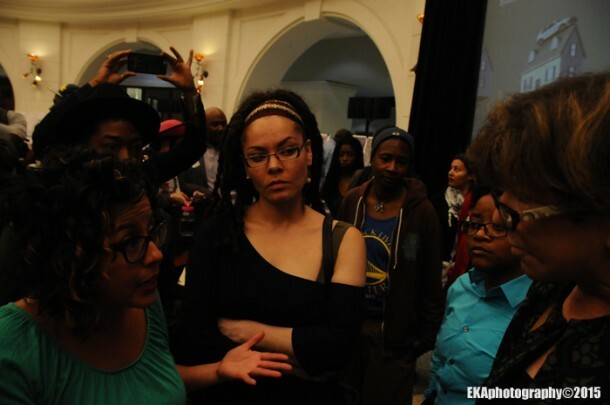 Some next steps to take would be to a) contact Gibson-McElhaney’s office or, even better for Oakland residents outside D3, your own Councilperson’s office, and let them know you support a restored Arts & Culture Commission, as well as a fully-staffed Cultural arts department; b) communicate your thoughts on what downtown’s future should be on Twitter using the hashtags #plandowtownoakland and #KeepOaklandCreative.